From beginner to expert, you will find all different skill levels in these crochet pattern books from the past. Some of the designs are pretty basic, quick and easy. Others more challenging. 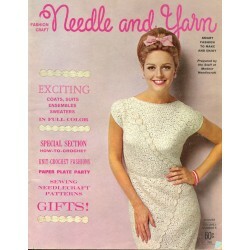 Whatever pattern you decide on, the vintage and antique designs are just plain cool and fun to crochet!Today's crochet thread and yarns will add a new dimension to the sweaters, doilies, and afghans you will find in these books. Let your imagination go wild and have fun while crafting something fun and unique. Crochet There are 80 products. 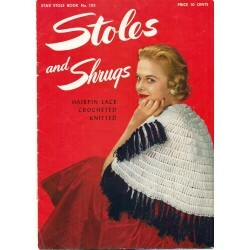 Crochet, knitting and hairpin lace are in this vintage pattern book from Star. Even has several different fringe patterns you can add to your creations. Different shawls, scarves, shrugs, stoles and bolero style jackets will help keep you warm this spring and summer. 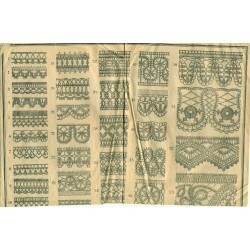 Unique 1950s charm for the items you can crochet, knit or make with hairpin lace. 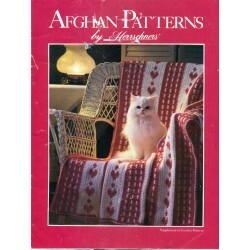 Crochet afghan patterns from Herrschners and the 1980s! Crochet a nice afghan blanket with one of these vintage patterns. Light and lacy, warm and cozy, there is sure to be something nice to cover up or cuddle with. One of these five patterns are sure to do the trick! 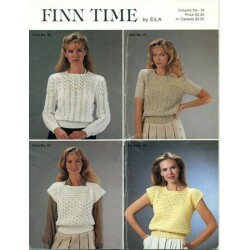 Knit and crochet patterns from the 1980s. Brunswick No. 818. 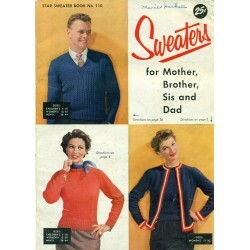 Sweater patterns for men, women and children - all of the family are here. Lacy, openwork crochet or cozy, warm cable knit and Fair Isle. Pullovers and cardigan style. 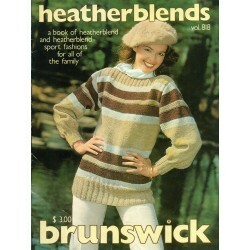 Crochet or knit something nice for any member of the family with this Brunswick pattern book. Crochet and tatting patterns. Make lace, collars, edgings, doilies, chair sets and napkins with these instructions from Clark's, J&P Coats and Spool Cotton Company. Original, vintage pattern book from the 1940s. 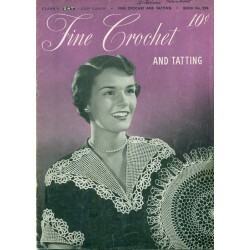 There are 22 different patterns in this book you can crochet and tat. Create something beautiful for your clothing or home! Vintage, 1970s Mary Maxim catalog and sample yarn card. All in their original envelope. 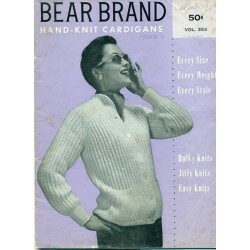 Sixty-four pages full of different crafts, knitting, crochet, sewing, patterns and so much more. 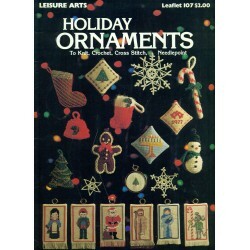 This is a terrific reference for different styles and identification of items from the 1970's. 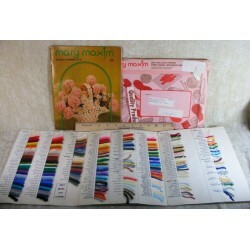 Also, the Mary Maxim catalog is just plain fun to look at! 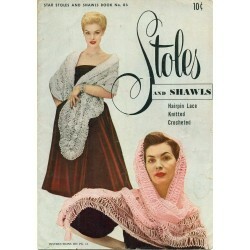 Knitting, crochet and hairpin lace patterns are included in this shawl and stole pattern book! Star Vol. 86. There is even a pattern for a shrug. Some lacy, some warmer, one with a tartan pattern - All have vintage, 1950s charm and style. Knit, crochet or hairpin lace a pretty accessory to keep you warm. 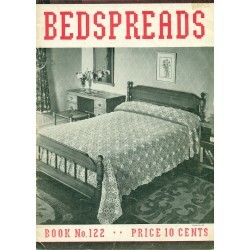 This is a great little vintage how to book for many different crafts! Instructions on crochet, hairpin lace, knitting, tatting, netting, embroidery, smocking, huck weaving, needlepoint, hooked, braided and knitted rugs and more. Illustrated. 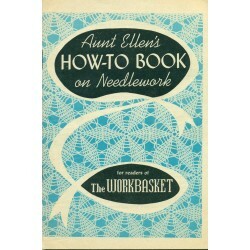 Knit, crochet or hairpin lace one of the patterns in this book. Star No. 149 - American Thread. 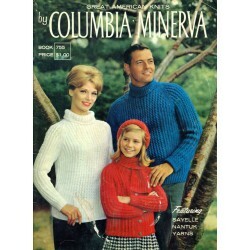 Vintage, 1960's styles - some kooky and crazy like the ski masks. Lacy shawls, sweaters, afghans, loopy caps, mittens, boots. These knit, crochet and hairpin lace instructions are recipes for lots of fun and fashion! 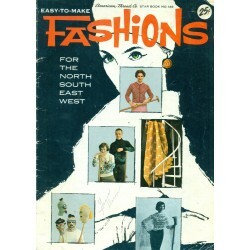 Knit and crochet patterns in this book from the 1960s! Accessories like scarves, hats, sleeveless shells, slippers, mittens, socks and more. Coats & Clarks #152. Patterns for women, men and children. Plenty of accessories and fashions to help keep everyone warm this winter. Several unusual styles of hats and slippers. 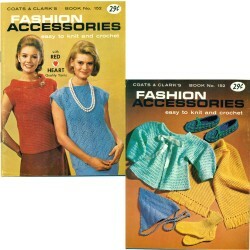 Knit or crochet one of these accessories from the 1950's! Something for all members of the family. Cute puppet mittens even. Or, crochet the pompom slippers. Hats, gloves, mittens, scarves and more. Fun and cute patterns from Coats and Clark's, No. 290. Warm and fun knitting and crochet accessory patterns. Knit and crochet pattern book for baby! Star No. 96 from the 1950s. Great infant patterns like bonnets, caps, sweaters, booties, soaker / diaper, layette sets, and more. All are so very cute and perfect for any baby. 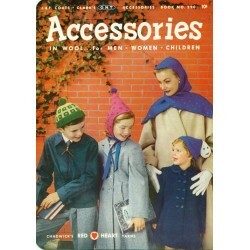 You can knit or crochet something with vintage charm with one of these patterns from Star for the infant in your life. 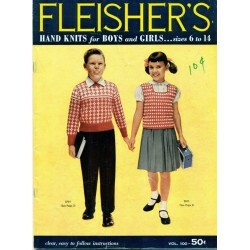 Cute knitting and crochet patterns are in this pattern book from Fleisher's Hand Knits! Vintage, 1950's charm for children. Different patterns include sweaters, coats, hats, skirts, jackets, jumpers and more. 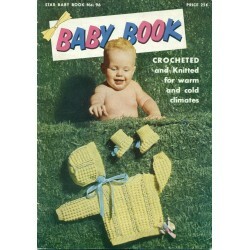 You can create something nice for the child in your life to wear with this vintage pattern book. Original, not a download or reproduction.